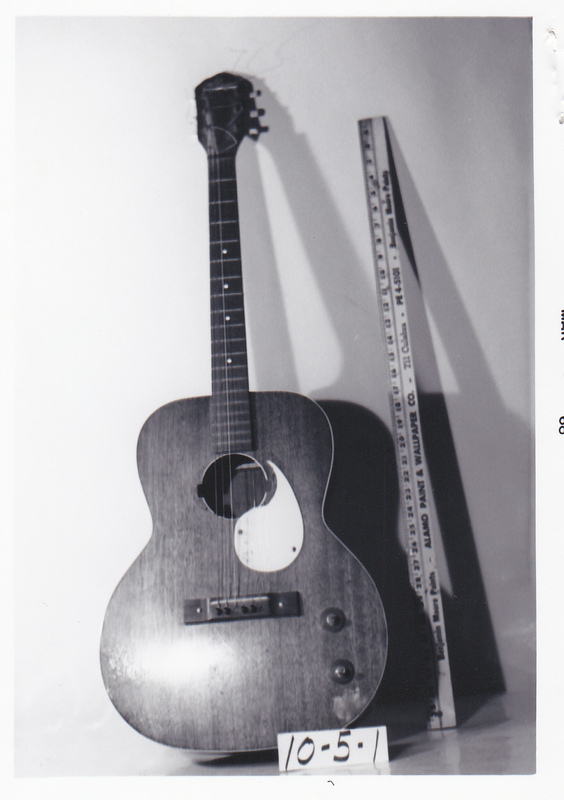 This semi-acoustic guitar was formerly owned by Sam Lightnin’ Hopkins and originally manufactured by Kay Musical Instrument Company during the early 1950s. The guitar model is hollow-bodied with six-strings and designed for right-handed players. Sam Lightnin’ Hopkins was a renowned blues singer and guitarist born in 1911 in Centerville, Texas. Sam was introduced to music at a young age. He and his friends Lee Gabriel and Lorine Washington would often go square dancing on Saturday nights. It was here that he learned to listen to the music’s soul and dance with it. His father was a preacher at the local church and the entire family helped participate by singing every Sunday. He gained an interest in music and made his first instrument, a cigar-box guitar, during his early childhood. His older brothers John Henry and Joel taught him how to play the guitar; unbeknownst to any of them, it was then that a star had been born. In the early 1940s, Sam moved to Houston to continue his career in music. He found his home in the Third Ward, which at that time was teeming with upper class culture and nightlife. Competing with the other musicians determined to make a living as a performer, Sam took any job he could to help pay the bills. He was often seen playing on the streets for whatever tips he could accrue. By a stroke of luck, music manager Lola Ann Cullum for Aladdin Recording Company happened to be attended the very same nightclub Sam had been performing at one night. She enjoyed his vocals and thought he had what it took to make it big. In 1946 he earned a recording session with Aladdin Recordings in Los Angeles, where he met Wilson “Thunder” Smith and (by some accounts) earned the nickname “Lightnin.” There are a number of stories about how Mr. Hopkins came by his nickname. Others have said it was blues guitarist Blind Lemon who said Sam “electrified” people. Decades later, he claimed to have invented the name himself, inspired from being struck by lightning on his front porch. 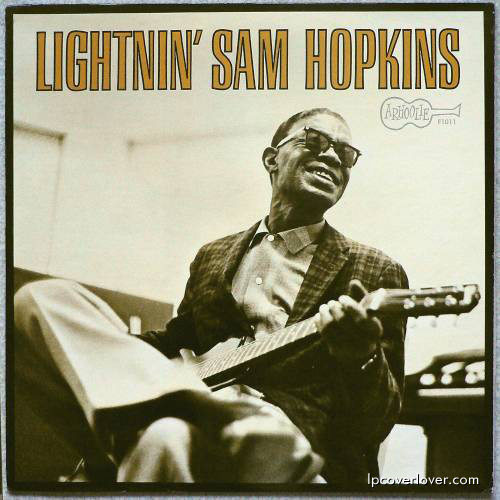 Listen to “Ain’t No Cadillac” by Sam Lightnin’ Hopkins in the following video. Over the length of his career Hopkins recorded his music with nearly twenty different recording labels and recorded over 85 albums, but did not gain recognition outside of the African-American community until he began working with the producer Sam Charters. He became a significant figure in the folk-blues revival during the 1960s as he toured the United States and Europe. Hopkins often wrote impromptu songs, autobiographical songs, or songs centering on legends. Some of his biggest hints included: “Shotgun Blues,” “Mojo Hand,” and “Penitentiary Blues.” Many of his songs caused him to be recognized as a musical spokesman for the under-recognized southern African-American community and the injustices felt by minorities during the Civil Rights movement. Alan Govenar, Lightnin’ Hopkins: His Life and Blues. Chicago: Chicago Review Press, 2010.